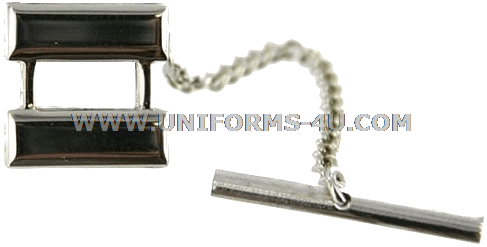 Our tie tack or tie clasps for officers in the O-3 pay grade—Captains in the Air Force, Army, and Marine Corps and Lieutenants in the Navy and Coast Guard—is an excellent way to display your attention to detail and pride of service. It is authorized for wear in all five branches of the Armed Forces of the United States, but each service has guidance on how the tack or clasp is to be worn. Navy regulations allow it to be worn with the four-in-hand tie, one inch below the center and positioned horizontally. It should be covered by the uniform coat. Marines wear tie clasps or tacks horizontally, placed on the lower half of the necktie halfway between the third and fourth buttons from the top of the shirt. In the Air Force, tacks and clasps are centered between the bottom of the knot and tie’s bottom tip. Coast Guard uniform regulations call for tie tacks/claps to be worn aligned with the middle of the shirt pocket and, like the Navy, prohibits them from being visible when worn the coat is worn. Army regulations do not state where tie tacks or claps are to be worn on the tie.